The user (member of a club or association) is registering to the SORS system via a predefined form. for filling and it is up to the user which to fill in the optional items. The registration form is information-based to provide as much information as possible about the shooter that will be used by race organizers and your subsequent sign-up (sign-in) for a particular shooting match. the less you will have to deal with filling in the data when you sign up to the appropriate race. 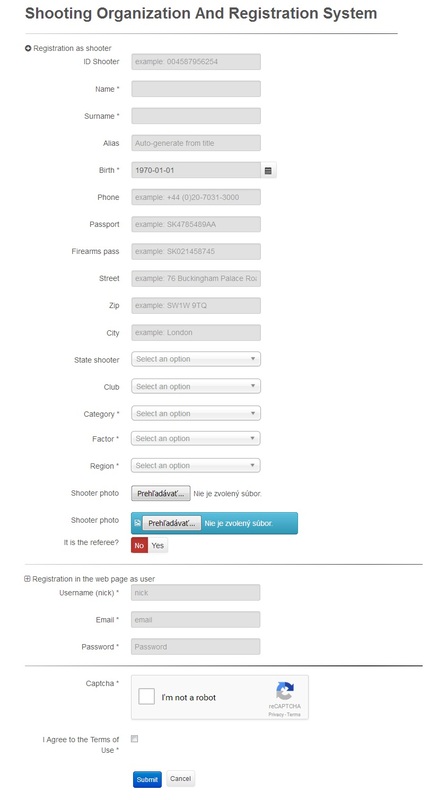 Sensitive information such as date of birth, passport number, firearms licence, or telephone number (and others), are not freely available (visible on the webpage) and are only available to SORS users with MANAGER privileges (ie club president, who organize the appropriate races and need detailed information about the shooter who enters the shooting match). Insert new SQUAD is only allowed for users with MANAGER status. .Check out this event! The SORS system is designed to create a certain shooting comfort for the shooter. .Check out this event! This is a simple procedure for users with the status of MANAGER. .Check out this event! The racing organizer can join the STAGES to your match. .Check out this event! Insert a new race is only allowed for users with MANAGER status. .Check out this event!